A map showing Japan's prefectures. 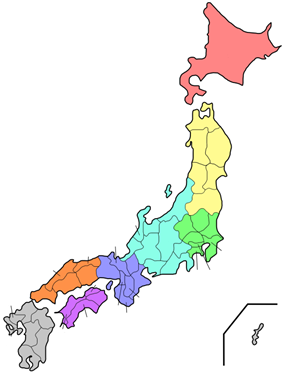 The 47 prefectures of Japan form Japan's first level of jurisdiction and administrative division. They consist of 43 prefectures (県 , ken) proper, two urban prefectures (府 , fu , Osaka and Kyoto), one "circuit" or "territory" (道 , dō , Hokkaido) and one "metropolis" (都 , to , Tokyo). 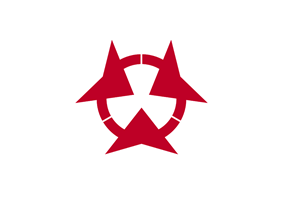 The first prefectures, replacing the provinces of Japan, were created by the Meiji Fuhanken sanchisei administration in 1868. The chief executive of each prefecture is a directly-elected governor (知事, chiji). Ordinances and budgets are enacted by a unicameral assembly (議会, gikai) whose members are elected for four-year terms. Under the current Local Autonomy Law, each prefecture is further divided into cities (市, shi) and districts (郡, gun) and each district into towns (町, chō/machi) and villages (村, son/mura). For example, Hokkaido has 14 subprefectures which act as branch offices (支庁, shichō) of the prefecture. Some other prefectures also have branch offices, which carry out prefectural administrative functions outside the capital. Tokyo, the capital, is a merged city-prefecture; it has features of both cities and prefectures. Those fiefs were headed by a local warlord or family, and despite that those fiefs have long since been dismantled, merged, and reorganized numerous times over, and given legislative governance and oversight, the rough translation stuck. The current system was established by the Meiji government in July 1871 with the abolition of the han system and establishment of the prefecture system (廃藩置県 haihan-chiken). Although there were initially over 300 prefectures, many of them being former han territories, this number was reduced to 72 in the latter part of 1871, and 47 in 1888. The Local Autonomy Law of 1947 gave more political power to prefectures, and installed prefectural governors and parliaments. In 2003, then-Prime Minister Junichiro Koizumi proposed that the government consolidate the current prefectures into about 10 regional states. The plan called for each region to have greater autonomy than existing prefectures. This process would reduce the number of sub-prefecture administrative regions and cut administrative costs. The Japanese government is also considering a plan by which several groups of prefectures would merge, creating a sub-national administrative division system consisting of between nine and thirteen states, and giving these states more local autonomy than the current prefectures enjoy. As of August 2012, no reorganization has been scheduled. Japan is a unitary state. The central government delegates many functions (such as education and the police force) to the prefectures and municipalities, but retains the overall right to control them. Although local government expenditure accounts for 70 percent of overall government expenditure, the central government controls local budgets, tax rates, and borrowing. Fiscal transfers, directed by the central government, account for around one-third of local government revenue. Despite the differences in terminology, there is little functional difference between the four types of local governments. The sub-national governments are sometimes collectively referred to as to-dō-fu-ken (都道府県) in Japanese, which is a simple combination of the four terms. Tokyo is referred to as to (都), which is often translated as "metropolis." The Japanese government translates Tōkyō-to as "Tokyo Metropolis" in almost all cases, and the government is officially called the "Tokyo Metropolitan Government". However, there are some people who call Tōkyō-to "Tokyo Prefecture" in English. Following the Potsdam Declaration. Many of Tokyo's special governmental characteristics disappeared during this time, and the wards took on an increasingly municipal status in the decades following the surrender. Administratively, today's special wards are almost indistinguishable from other municipalities. The postwar reforms also changed the map of Tokyo significantly: In 1947, the 35 wards were reorganized into the 23 special wards, because many of its citizens had died in the bombardments during the war, many survivors had left the city, and many men who had been drafted had not returned. There are some differences in terminology between Tokyo and other prefectures: police and fire departments are called chō (庁) instead of honbu (本部), for instance. However, the only functional difference between Tōkyō-to and other prefectures is that Tokyo administers wards as well as cities. Today, since the special wards have almost the same degree of independence as Japanese cities, the difference in administration between Tokyo and other prefectures is fairly minor. In Osaka, several prominent politicians led by Tōru Hashimoto, mayor of Osaka City and former governor of Osaka Prefecture, are currently proposing an Osaka Metropolis plan, under which the Osaka City, and possibly other neighboring cities, would be replaced by special wards similar to Tokyo's. When Hokkaido was incorporated, transportation on the island was still very underdeveloped, so the prefecture was split into several "sub-prefectures" (支庁 shichō) that could fulfill administrative duties of the prefectural government and keep tight control over the developing island. These sub-prefectures still exist today, although they have much less power than they possessed before and during World War II: they now exist primarily to handle paperwork and other bureaucratic functions. "Hokkaido Prefecture" is, technically speaking, a redundant term, although it is occasionally used to differentiate the government from the island itself. The government of the prefecture calls itself the "Hokkaido Government" rather than the "Hokkaido Prefectural Government". ^ Regional System"Doshusei" National Association for Research Advancement. ^ 都庁の所在地 Shinjuku is the location of the Tokyo Metropolitan Government Office.But Tokyo is not a "municipality".Therefore, for the sake of convenience, the notation of prefectural is "Tokyo". Note: Due to the division of Korea, Kōgen (Kangwon/Gangwon) and Keiki (Gyeonggi) are divided between North Korea and South Korea. While both Koreas each has its own Kangwon/Gangwon Province, the North Korean portion of Gyeonggi has been absorbed into other provinces.